This post is about What is Capacitor, Why we need Capacitor in Circuit and Working of Capacitor. Capacitor is the second important member in the triad of passive electronic components. It is very hard to find any electronic or electrical circuit without capacitor. Capacitor stores charge and can act like a battery. It is necessary in filter circuits to minimize voltage spikes, smoothing changes in voltage. Like resistors, capacitors can also create voltage divider network. Capacitance is the property which store input energy in the form of electrical charge and return almost all store energy to other circuit elements. Capacitor is passive electrical component having property of capacitance. Using water analogy, capacitor is similar to a bucket holding water. Capacitance defines capacitors capacity (ability) to store electrical energy, just as capacity of bucket to hold water. More the capacitance more is capacity to store charge. The amount of electrons store in capacitor is also known as Capacitance. The unit of capacitance is Farad (F). A 1 F capacitor is very rarely found in circuits. Usually, capacitor is use in micro to pico Farad range. Capacitor is a two-terminal passive component having property of capacitance. This property electrifies (charging with electricity) capacitor with input voltage. As capacitors condense (store) electricity, hence it is also known as condenser. The capacitor symbol looks like two parallel lines with one line is either curve or flat. There are two types circuit symbols of capacitor; Non-polarized and polarized. The basic structure of capacitor consists of two parallel metal foils (very thin sheets of metal). 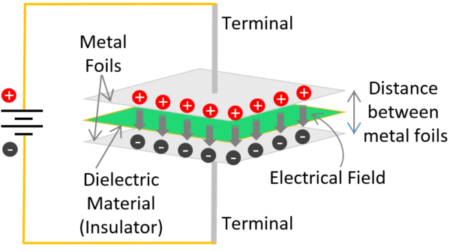 The metal foils act as electrode. Dielectric material is use as as insulator to separate metal foils. 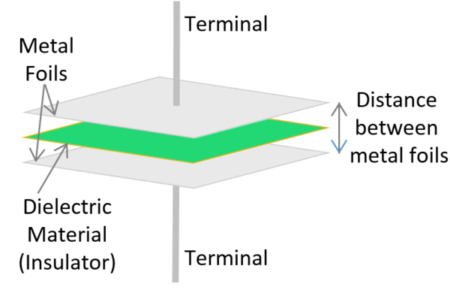 The term “di” in dielectric refers to placement in between two (di) foils and electric means it holds electric field. The circuit symbol of capacitor nearly looks like basic structure of capacitor. Where, ϵ (epsilon) is permittivity (a kind of resistance present when electric field is establish in a medium), ϵ0 is permittivity of air (vacuum) with constant value of 8.85 × 10−12 Farad/meter, ϵr is permittivity of dielectric material/relative permittivity/dielectric constant. The typical values of dielectric constant for various commonly use dielectric materials are: Vacuum = 1, Air = 1.006, Paper = 3.85, Mica = 3 – 6, Glass = 3 – 10 etc. Also, ‘A’ denotes plate area and ‘d’ is distance between plates. The electric charge is the backbone of component like capacitor. The construction of capacitor shows that there is a gap in between two metal foils. Hence, when electric current passes through capacitor, because of the gap, charge get “freeze” on metal foils. The foil with more electrons get net negative charge and foil with less electrons get positive charge. The dielectric material present in between metal foils do not allow charges to get attracted to each other. Hence these steady charges forms electric field. This structure resembles with the battery. Hence capacitor act as battery. Capacitor and battery stores electrical energy in the form of electrical charge and chemical energy respectively. Let’s take a simple example to understand how capacitance allows capacitor to act like a battery. There are two switches controlling two parts of the circuit. A capacitor is shown in cylindrical shape and looks like small DC battery. Watch animation carefully..!!! When upper switch is close and lower switch is open, capacitor is connected with battery and get isolated from other circuit elements. This starts charging of capacitor. Capacitor is kept in charging position for some time, this produces certain amount of voltage inside capacitor. An LED is present in circuit to demonstrate discharging of capacitor. When upper switch is open and lower switch is close, capacitor get isolated from battery and is connected with other circuit elements. Now capacitor is acting as voltage source. Take a close look at light intensity of LED and voltage drop in capacitor. At start, capacitor easily provides minimum required forward voltage to LED. But when capacitor voltage start to decrease; light intensity of LED also decreases. Finally LED get turn OFF but a small voltage is still remaining in capacitor which is less than minimum forward voltage of LED. You might have read or listen about strange behavior of capacitors toward DC signal. It is said that capacitor blocks DC, actually it should be written as capacitor blocks DC current. The question arises why so? There are two answers for this question. If we look at the construction of capacitor, there is a tiny gap in between two conducting materials. This gap block the path of direct current and don’t allow it to flow through capacitor. This may look like very general and simple explanation. But, there is also a mathematical proof. There is a derivative (varying something with respect to time) of voltage in current equation. In case of AC signal, voltage is not steady (continuously varying) and oppositely in DC signal, voltage is steady. According to rules, a derivative of steady (constant) value is zero. Hence for DC signal above equation gives value of I equal to zero. This is the reason behind capacitor blocking DC but passing AC current. I hope you enjoy reading this post and now you know what capacitor is and why we need capacitor in circuit. Capacitors are key component of filter part present in every power supply circuit. In next post we’ll learn about time constant and combinations of capacitor. Thanks for reading.